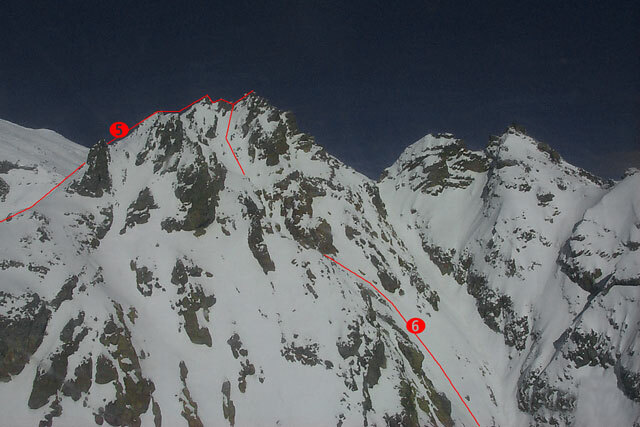 The highest of the three main pinnacles. 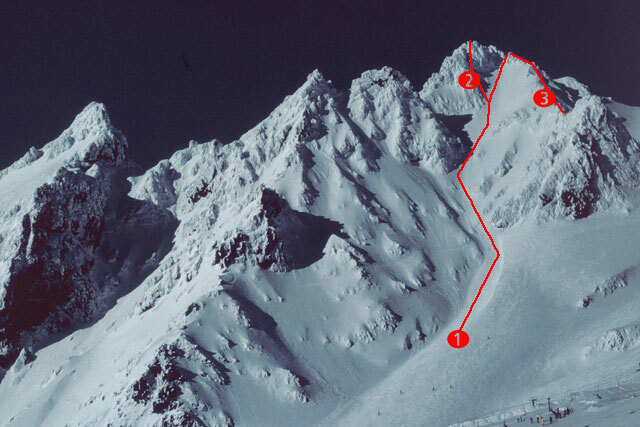 First Pinnacle also has several opportunities on its northern and eastern sides, but you’ll almost always need to get up early to avoid hot, soft conditions on the northern aspects. Only really much of a zig-zag in summer. Leave Gully 2 where it turns towards the col, and follow the broad, shallow gully to a notch in the ridge between First Pinnacle and the gendarme at the top of its West Ridge. Climb out of Zig-Zag Gully and direct to the top. Gain the col beyond Pink Floyd Buttress from either side, and continue up the ridge to the summit. Alternatively (but significantly harder), start with Wish You Were Here on the toe of Pink Floyd Buttress. In the right conditions this looks to be a nice, straightforward climb. A good line that unfortunately tends to soften very quickly once the sun hits it. A gully runs direct to the summit. Again, watch for soft conditions.